Galileo Suite: electromagnetic modeling and simulation tool | IDS Ingegneria Dei Sistemi S.p.A.
All the available products have been validated by extensive physical testing campaigns (using both IDS’s physical testing solutions as well as measured data from research projects), and their efficiency and effectiveness is continuously improved to respond to the more and more demanding requirements of the market (IDS also uses these products in its daily work to perform consultancy services). Galileo is the only electromagnetic modeling and simulation CAE suite on the market that benefits from the synergy between expertise, experience and best practice that has been matured while performing consultancy services for industrial applications and virtual testing solutions. As a result of these features Galileo is the only CAE tool available on the market that covers the gaps between good CAE Maxell equation numerical solvers and professional tools for industrial or research applications on real-life problems as well as (but not only) on complex applications such as in the aerospace, defense, naval, automotive, communication and internet of things fields. Galileo is a family of highly integrated professional products for industrial applications on real life complex problem, providing a comprehensive suite of CAE tools that give full access to IDS’s high tech integrated solutions and services, technology and experience. Galileo EME (ElectroMagnetic Engineering): an integrated environment tailored for the concurrent design, assessment and mitigation of radar and infrared signatures of complex platforms (e.g. ships, aircraft, unmanned vehicles, satellites and more). It is suitable for large programs (e.g. 1-10 years), where many platform versions have to be analyzed and kept under configuration control. In addition to validated and state-of-the-art modeling tools and professional pre- and post-processing functions, it provides multi-user features and, through the use of an Oracle DB, data management capabilities that are essential to managing huge amounts of data. 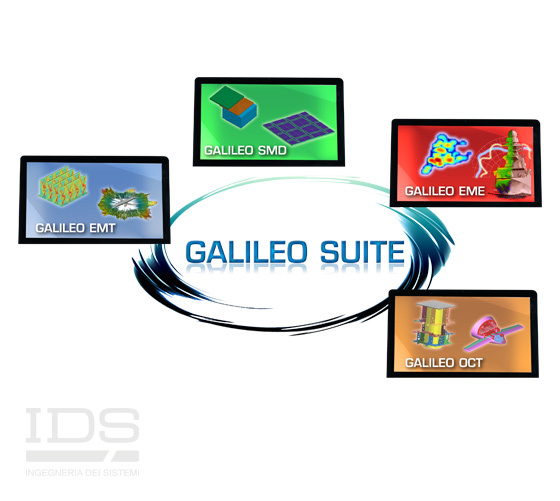 Galileo-SMD (Smart Material Designer): A CAE tool specifically developed for the analysis, design and optimization of several types of smart materials (also called engineered materials, metamaterials or metasurfaces), based on periodic or quasi-periodic repetition of sub-wavelength cells. Galileo-OCT (Oversized Cavity Theory): A CAE tool based on the Oversized Cavity Theory that is specifically designed for the analysis of radiated emission radiated susceptibility (RE/RS) in overmoded cavity environments (avionic bays and satellite cavities etc. ).